Floral Jug Stamped Underneath 694 ... Is It Crown Lynn? Re: Floral Jug Stamped Underneath 694 ... Is It Crown Lynn? As we don't have the 694 in our Crown Lynn Shapes Gallery I would be very keen to see a photo. 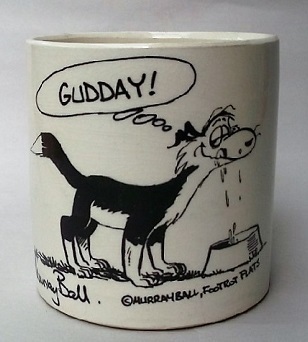 You could email it to the site on newzealandpottery@gmail.com and I could load it for you if you like. It would be great to see a photo of the base as well. Jawg sent these photos to the site to find out more about the pieces. He is sure that the black 553 vase is Crown Lynn and that is correct, these were first made around 1960. The 694 jug he feels 95% sure is Crown Lynn but has never seen another.....? It's a beautiful ornate jug and I've never seen anything like it before .... lets hope that someone comes along with some info about it. My thoughts are that the jug isn't Crown Lynn ..... why - do you ask? Many potteries put numbers on the base of their ware in England and Titian did it too, not only Crown Lynn. Even the lovely glaze doesn't jump out at me as a Crown Lynn glaze. I could be wrong and stand to be corrected, but as nobody else has commented I thought I should. The 694 jug is English made by Beswick. Not sure if my eyes are failing me but I can almost see a faint Made in England impressed mark running around the top of the model number.